Keeping the BJP guessing, the JMM today said it was in touch with the Congress and all options were open, including changing its alliance.“It is for the BJP to look for options. I am in touch with both the Congress and BJP. All options are open. My government will stay,” Soren, who has to step down as chief minister by June 30, if he is not elected to the assembly by then, told reporters here. The Union Home Ministry has recommended to the Chhattisgarh government that action should be taken against two IPS officers, including the Bastar IG, for alleged lapses in connection with the Maoist massacre of CRPF personnel in Dantewada.In a letter to the Chhattisgarh government, the Ministry said the report of EN Rammohan, who probed the April 6 killing of 75 CRPF personnel and a local policeman by the Naxals, found lapses on the part of IG TJ Longkumer and Dantewada Superintendent of Police Amresh Mishra. The Jaipur Development Authority (JDA) on Thursday finally took over the possession of Laxmi Vilas Hotel and Kanak Bhawan located on the erstwhile royal family’s Rambagh Complex. Both the premises have been sealed. Commander Dilip Donde of the Indian Navy today became the first Indian ever to circumnavigate the globe solo on a sailboat when he steered into the Mumbai harbour after his arduous effort spanning a little over nine months. Six Gorkha Janamukti Morcha (GJM) activists have been arrested in connection with the killing of Gorkha leader Madan Tamang yesterday in Darjeeling, IG (North Bengal) KL Tamta said today. LS panel chief proves identity for 4th time! Ask five-time Congress MP from Andhra Pradesh and a former Speaker’s post hopeful V Kishore Chandra Deo how important is caste to a politician and he is sure to cross his fingers. Salman Khan was drunk when he allegedly rammed his car into a bakery in Bandra in 2002, a chemical analyst who tested the actor’s blood sample after the accident has told a trial court. The Air India aircraft that crashed at Mangalore airport today was commandeered by a British national of Serbian origin, who had 10,000 hours of flying experience and had been operating in India for the last two years. Co-pilot HS Ahluwalia was new to Air India Express airline. He was previously with Jet Airways and had 3,750 hours in the cockpit. The Mangalore International Airport at Bajpe, around 20 km from Mangalore, is called table-top as it is surrounded by deep valleys. Aviation experts say flying into Mangalore is trickier than others airports because the airport is on the top of a hill and surrounded by sudden drops that are around 30m from the runway. Family members of each of those killed in the Mangalore plane crash will get up to Rs 76 lakh as compensation.Prime Minister Manmohan Singh has announced Rs 2 lakh compensation to each crash victim family and Rs 50,000 each to those injured in the Air India aircraft crash from the Prime Minister’s National Relief Fund. It had been just four months since 25-year-old Tejal Kamulkar, one of the six crew members aboard the ill-fated Air India Boeing 737-800 that crashed at Mangalore airport today, had started working as an air hostess for the airline, fulfilling her dream to "soar the skies". It might not be known when the next cyclone will hit the northern Indian Ocean, but what is already known is its name — Bandu, an official said. The 1,000-km long coastline of Andhra Pradesh has been one of the most vulnerable regions in the country to cyclonic storms. It has faced nature’s fury several times in the recent past. The cyclone of 1977 has been the deadliest so far, claiming over 10,000 lives. It was a miraculous escape for eight passengers on board the ill-fated Air India flight which crashed here this morning as they managed to jump out of the aircraft soon after it hit the ground. Striking a defiant note, the JMM chief had yesterday said he would complete his tenure, backtracking on his May 18 statement that he would resign after the party reached an agreement with the BJP for sharing power on a rotational basis with the BJP to head the government first. His son, Hemant Soren, JMM’s legislative party leader was more forthright today. “We are also in touch with the Congress, and if the situation warrants, we can change our alliance,” he told reporters here. The BJP, however, accused the Congress of trying to repeat the Madhu Koda-experiment with Independent MLA Bandhu Tirkey by promoting him for the chief minister’s post. “They had experimented (with Madhu Koda) earlier for about 23 months, and now they are trying to repeat the experiment,” BJP national general Secretary Arjun Munda, who was the party’s chief ministerial candidate, said. Tirkey said he did not nurse such ‘illusions’ but would support any non-BJP government. “I don’t have such aspirations. I don’t even desire a minister’s post, let alone the CM’s. I have withdrawn support to the government as we prefer a non-BJP government in the state,” Tirkey told PTI over the phone. Tirkey, who is the lone MLA of the Jharkhand Janadhikar Manch, had withdrawn support to Soren government soon after the JMM offered the BJP the CM’s post. Hemant said the JMM was determined to complete its full term. He claimed there was no written understanding between the JMM and the BJP that power would be handed to the ally on May 25. “We are mystified as to how the date emerged. Our party president is the chief minister now and will remain so,” he said. The chief minister said he would meet JMM legislators tomorrow in Ranchi and make “a final announcement”. Soren, whose voting for the UPA during a cut motion in the Lok Sabha on April 28 prompted the BJP to decide on withdrawal support to his government, has to find a constituency to enter the assembly by June end. He is currently an MP. He failed to enter the assembly during his second stint, losing a bypoll from Tamar constituency in January 2009, leading to imposition of President’s Rule in the state for a year. His first term in 2005 lasted just nine days. The JMM and the BJP have 18 MLAs each and the Soren government has the support of two JDU legislators and five from the AJSU, besides two others in the 82-member assembly. The Union Home Ministry has recommended to the Chhattisgarh government that action should be taken against two IPS officers, including the Bastar IG, for alleged lapses in connection with the Maoist massacre of CRPF personnel in Dantewada. In a letter to the Chhattisgarh government, the Ministry said the report of EN Rammohan, who probed the April 6 killing of 75 CRPF personnel and a local policeman by the Naxals, found lapses on the part of IG TJ Longkumer and Dantewada Superintendent of Police Amresh Mishra. “We have recommended that action should be taken against Longkumer and Mishra as there were lapses on their part. As both officers are serving in Chhattisgarh, it is the responsibility of the state government to take action,” an official said. While Longkumer is a 1991 batch IPS officer, Mishra belongs to 2005 batch. Deputy Inspector General of the Bastar range KS Prasad Kalluri, who was present at the planning of the operation that led to the worst-ever tragedy in the history of CRPF, has surprisingly escaped the wrath of the government. The CRPF has already shunted out its Deputy Inspector General Nalin Prabhat and two other officers for their alleged lapses. The decision has been taken after considering the Rammohan Committee report and the court of inquiry conducted by the CRPF. The Rammohan Committee had inquired into the April 6 incident in which 76 security personnel were gunned down by the Naxals in Chintalnar of Dantewada district. Initially, the kin of hotel owners resisted the JDA’s move and didn’t allow the JDA team to enter into the premises. Later, DIG Malini Aggarwal, Additional Commissioner Durga Joshi and other officials reached the spot after which the process to take over possession of both the properties began. The hotel owner and those residing in Kanak Bhawan were given two hours’ time to vacate the premises even as heavy police force had been called to deal with any eventuality. The JDA exercise started at 12 noon and lasted for about two-and-a-half hours. The authorities didn’t have to face much difficulty though they had a tough time dealing with those residing in Laxmi Vilas Hotel and Kanak Bhawan. Earlier on Wednesday, the JDA enforcement squad had demolished the marriage lawn adjoining Laxmi Vilas Hotel and pulled down the boundary walls of Kanak Bhawan. The JDA latter claimed to have freed 9,305 sq mtr of land from the “encroachers”. Interestingly, the JDA action came after the Rajasthan High Court did some tough talking with the JDA, asking it why it didn’t remove encroachments in Rambagh area as directed by it earlier. Commander Dilip Donde, who started the voyage on August 19 last year on INSV Mhadei, touched base back in India at the Sunk Rock Light House here. His boat was ceremonially escorted by a fast attack craft of the Indian Navy along with speedboats and two tugs operating their water canons. 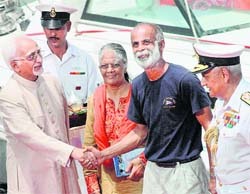 Vice-President Hamid Ansari along with Chief of Naval Staff Admiral Nirmal Kumar Verma and Donde’s family members, who were on board INS Delhi, anchored at the finish line, witnessed the historic moment and gave him a rousing reception. "Having completed the voyage, I am feeling great. I could not have done it without this fine boat. The credit goes to Mhadei," said Donde. The 56-foot-long Mhadei, with 23-tonne displacement, is the first fibreglass yacht constructed entirely in India and boasts of state-of-the-art navigation and communication equipment. "It gave me a big kick," he said after he returned to the city after the 276-day voyage, as part of the Navy's daunting 'Sagar Parikrama' project, which aims to revive the old tradition of sea faring. The Vice-President described it as a momentous occasion. "It is an occasion that makes every Indian happy, proud and willing to emulate. I think that would be the greatest tribute to what Commander Donde has done. It was a long awaited first and it was done very well. Donde has shown that skill, determination and courage can achieve what is considered to be immensely difficult, if not impossible. So far, 175 people across the world have managed to finish such a task," Ansari said. The 42-year-old officer covered 21,600 nautical miles sailing in the seas to achieve the milestone. He sailed through the Pacific Ocean, the Atlantic Ocean and the Arabian Sea. He also sailed along the Equator. He made only four halts during the voyage, at Fremantle - Australia, Christchurch - New Zealand, Port Stanley - Falkland Islands and Cape Town - South Africa. Donde, a National Defence Academy alumnus and a trained clearance diver in the Indian Navy, volunteered for Project 'Sagar Parikrama' and also trained with legendary Sir Robin Knox-Johnston, the first man to sail solo and non-stop round the world in 1968-69. Police, said he, were on the lookout for several other GJM leaders and workers allegedly involved in the murder of the Akhil Bharatiya Gorkha League president. GJM general secretary Roshan Giri has, however, denied any involvement of the outfit in the incident. He alleged that the state government had implicated them in the case for “ulterior” motives. Their party, said Giri, did not believe in the politics of murder and that was why no major incident of violence was reported during their prolonged agitation for a separate state (Gorkhaland). Meanwhile, no untoward incident was reported in Darje-eling after yesterday’s killing of Tamang in broad daylight at a public meeting even though tension prevailed in the area. A partial bandh was observed here today. West Bengal Municipal Department Minister Ashok Bhattacharyya, who hails from Siliguri, said the CPM and other like-minded parties had decided to oppose the GJM’s agitation for a separate state. And after yesterday’s killing, said he, the proposed peace talk on the GJM’s demands in Delhi on May 25 would be a futile exercise. For the fourth time in 33 years, Deo, the incumbent chairperson of the Lok Sabha Privileges Committee, has had to prove his tribal status as a member of Konda Dora tribe that has inhabited Kuruppam area in Andhra for decades. Just before the 15th Lok Sabha was to be constituted last year and rumours were abound that Deo might be the Congress’ pick for Lok Sabha Speaker’s position, the latter’s chances were dimmed by a petition filed in the Andhra Pradesh High Court, challenging the politician’s tribal status and his victory from the Araku ST seat in the state. The petitioner, Regi Maheshwar Rao, a lawyer, even faxed an appeal to President Pratibha Patil, alleging that Deo was not a tribal, hence, not eligible to contest from a reserved constituency. The orders spare Deo the embarrassment he suffered for a year at the hands of a habitual litigant. In the past, three enquiries on the same issue were held in 1977, 1999 and post 2004 Lok Sabha elections, with Deo’s establishing his status each time. But that didn’t keep Rao from petitioning the High Court against Deo this time. The first time the high-profile chairman of privileges committee of the Lok Sabha (which ordered record MP expulsions in 14th LS under Speaker Somnath Chatterjee) faced an identity challenge was in 1977 when he first entered the LS. The process repeated itself in 1999 and again in 2004. This year for the fourth time Deo has proved his antecedents, with the Collector quashing Rao’s petition saying it was based on school records and documents registered on sale of lands. “Deo has successfully established that he belonged to Konda Dora tribe by birth and practices Hindu religion,” the Collector ruled. As for Deo, he had to produce AP Gazateer records and manuals of district Vizianagaram in the Presidency of Madras compiled and edited by the then Collector DF Charmaechael to establish his case. So much for identity! Salman was taken into custody after he allegedly rammed his Land Cruiser into the Bakery in the wee hours on September 28, 2002, killing one person and injuring four others. The test report said 62 mg of alcohol was found from the blood sample of Salman, which was in excess of the permissible limit. The 53-year-old Z Glusica had his licence endorsed by the Directorate General of Civil Aviation, making him “capable” of flying in India, Air India Director (Personnel) Anup Srivastava told reporters in Mumbai. Suggesting that Glusica was competent, Srivastava said he had 10,000 hours of flying experience. He also sought to dispel impression that Glusica was not aware of the Indian conditions as he said that the pilot had been flying in India for the last two years. Glusica, along with co-pilot HS Ahluwalia, last flew into Mangalore on May 17, Srivastava said. Ahluwalia, who hailed from Karnataka, joined Air India Express in April last year. He is learnt to have joined the carrier for a quick promotion and is remembered fondly by his former Jet Airways colleagues. “He was married and had a two-year-old child,” a Jet Airways pilot said, describing Ahluwalia as “a very nice guy”. Ahluwalia left Jet Airways in 2009 and joined the airlines, which has a heavy presence of foreigners among its pilots. “He was slated to be sent for command training and would have become a commander soon,” one of Ahluwalia’s colleagues from Jet Airways said. Ahluwalia’s former colleagues also took umbrage to reports that pilots flying the crashed aircraft were new. “Ahluwalia may be new in Air India Express, but he was not new to flying. He was a pilot with Jet for about five years,” a Jet pilot said. Incidentally, Mangalore is not the only table-top airfield that India has. There are two others, one at Shimla in Himachal Pradesh and the other at Aizwal in Mizoram, says aviation expert Captain AN Hanfee, an ex-IAF pilot. To some extent, the airport at Kozhikode is also situated on what is “like a plateau”. Hanfee says Shimla and Aizwal do not pose much of a problem for pilots because flights operating from these airfields are smaller ATR aircrafts that do not require as bigger a landing run like heavier Boeing 737-800. In fact, Hanfee says there is no reason why international flight should be allowed to operate at a runway less than 9,000 feet in length and that also on a table-top that doesn’t have sufficient overshoot or undershoot margin. “If a pilot makes an error of judgement there is no margin for recovery. For example when a Sahara airline flight overshot the runway at Mumbai, slush worked as an arrester for the speed. But in Mangalore there is no such safety area at the end of the runway. An 8,000-feet on a table top is fine if a pilot makes a perfect landing and does not overshoot, but on a table-top there is no margin for error,” he says. Notably, all airfields where international flights land - Amritsar, Jaipur, Ahmedabad, Nagpur, Lucknow, Gaya, Kolkata, Guwahati, Hyderabad, Bangalore, Chennai, Goa and Mumbai - have longer runways. “My question is why are you allowing international flights to operate at a smaller runway and too a table top,” questions Hanfee. Another problem with the table top runway is that it creates an optical illusion that requires a very precise approach. “For the pilot, the most critical aspects of flying are take-off and landing,” a serving civil pilot says. In fact the Directorate General of Civil Aviation has prescribed “additional training requirements for table-top airports”. Interestingly, defence pilots, who have operated at shorter runways, do not think that the Mangalore airport poses any problem. “I have operated an AN-32 from a runway just 3,300 feet in length. I have landed at the Mangalore table-top when the runway was much shorter. For an aircraft of Boeing 737-800 kind, the runway is absolutely fine,” says a serving Air Force pilot. Civil Aviation Minister Praful Patel has said the airlines would give about Rs 72 lakh to the family members of each victim as per the provisions of the Carriage by Air (Amendment) Act. Under this Act, which has been amended as per The Montreal Convention, kin of each victim is entitled for up to one lakh special drawing rights (SDR) which as per the present exchange rates is worth about Rs 72 lakh. Karnataka Chief Minister BS Yeddyurappa has announced Rs 2 lakh compensation to each of the families of the 158 people killed in the crash at Bajpe airport. It was only two weeks ago that Kamulkar, who cherished a life-long dream to become an air hostess, had celebrated her first birthday after being recruited by Air India. Little did she know it would be her last. Kamulkar was among the 159 people who died in the crash. Kamulkar’s death has left her parents shell-shocked and her neighbours are just reactionless. It was only Pragnya Lele, Kamulkar's close friend and neighbor, who gave out the details. "It was Tejal's dream to fly like a free bird. It was to realise this dream that she did a diploma course in air hostess training from International Air Transport Association (IATA)," said Lele with tears in her eyes. "She was a good-natured and fun-loving person. It had been only four months that she started working at Air India and she was very happy about it. Who would have known she will meet with this tragic end?" she asked. Cyclones derive their names through a systematic procedure laid down by the World Meteorological Organisation (WMO) and the United Nations Economic and Social Commission for Asia and the Pacific (ESCAP). Cyclone Laila, which developed in the Indian Ocean off the Andhra Pradesh coast creating much havoc in the state, was named by Pakistan. The next to hit countries in the north Indian Ocean region will be called Bandu - a name given by Sri Lanka, and the one after that will be Phet, named by Thailand. Eight north Indian Ocean countries - Bangladesh, India, the Maldives, Myanmar, Oman, Pakistan, Sri Lanka and Thailand - have prepared a list of 64 names. or technical terms," Mahopatra explained. The countries take turns in naming the cyclones. The last six were: Nisha (Bangladesh), Bijli (India), Aila (Maldives), Phyan (Myanmar), Ward (Oman) and the most recent being Laila (Pakistan). Local names are used for cyclones to make it convenient for use. While some of the survivors managed to jump out of the Boeing 737-800 and reach a nearby road, others jumped into a pit to evade the massive fire engulfing the aircraft. Some of them were helped by people, including auto-rickshaw drivers and bikers to reach hospital. “I can’t believe I survived the crash,’ said Pradeep reliving the moments when the plane hit the ground after it overshot the runway. “There were vibrations before the plane crashed with a loud thud. As soon as it hit the ground, I managed to get out and jump into a pit. There was smoke all over as the plane caught fire. After ten minutes, there was an explosion,” he said. “A crack appeared near where I was sitting and I jumped out. Two or three people sitting behind me also jumped out. I am hurt in my knees and suffered burns on my hands and face,” said Farooq, who is being treated at a hospital here. Recounting the horrible experience, 32-year-old Abdullah Puttur Ismail, said the plane was on the runway when he heard a deafening sound from a tyre and then the plane crashed. “I somehow gathered my wits and removed my seatbelt and as I peeped out, I saw the right wing which was scraping the ground, had caught fire. When I looked up I saw a gaping hole. Somehow, I climbed up the seat and jumped out from the hole, straight into a thorny bush,” said the man, who is a port manager in Dubai. “My only thought was to escape. Unmindful of gashes on my legs and arms, I walked for some distance and saw some locals who had gathered there. They calmed me and gave me some water,” he said. “I saw the flight catching fire and heard the shrieks of my co-passengers inside the aircraft,” said Krishnan, who survived by escaping through a gap in the broken aircraft seconds after it crashed. Krishnan, a Kerala resident, said the aircraft shook as it lost one of its tyres immediately after the landing. “The moment I felt the unnatural movement of the flight, it turned turtle and hit an object like a tree. I looked upward when sunshine hit my eyes and I saw a gap in the aircraft, which was broken,” Krishnan said. Mumbai: For 24-year-old Saudi-based businessman Sameer A Shaikh going to attend the last rites of his grandmother, the Mangalore plane crash was a double blow as he lost 16 relatives in it.All of them, like Sameer, were going to Mangalore for the last rites of his grandmother, who died yesterday. “I flew into Mumbai from Saudi Arabia yesterday and was scheduled to catch a Jet Airways flight to Mangalore this morning as I could not get a connecting flight from there,” he said at the Mumbai Airport.Distraught over the tragedy that struck the family, Sameer said his maternal uncle, his wife and two children, besides 12 distant relatives were among those killed when Air India Express flight from Dubai crashed near Mangalore airport.